Collybia produce very nondescript fruitbodies, but subtleties of this drabness are actually very useful in recognizing the genus. 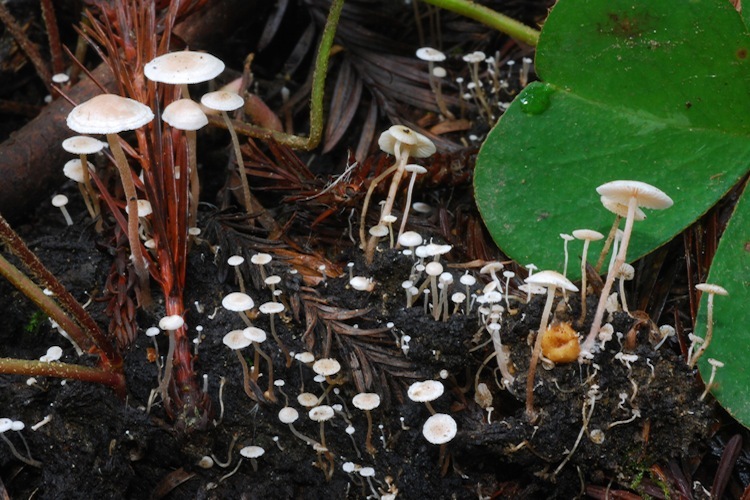 The fruitbodies are small or very small, are very pale colored (mostly white), have opaque (not usually translucent-striate) caps, and grow in troops and swarms. All but one species produce fruitbodies that emerge from sclerotia - a hard, variously shaped mass of mycelial fibers that are encased in a darker layer of protective cells. In Collybia these range from very small pea-shaped pale globs to elongate, reddish-brown tapered cylinders resembling appleseeds. The ecology of this genus is very interesting. Few other gilled fungi grow on the decaying remains of mushrooms, and many of those are parasitic. However, the role of Collybia seems to differ somewhat, since it only fruits after the 'host' mushroom has stopped releasing spores and significantly decayed. At what point in the 'host' mushroom's development does it become colonized by the Collybia? We don't know for sure. But it seems clear that this genus is perhaps more accurately characterized as saprobe with an odd niche than as a parasite. Two species are known from our county, with another species (Collybia tuberosa) possibly present. Identification of the genus is fairly easy once the pattern of troops or swarms of small, opaque, whitish caps is recognized. 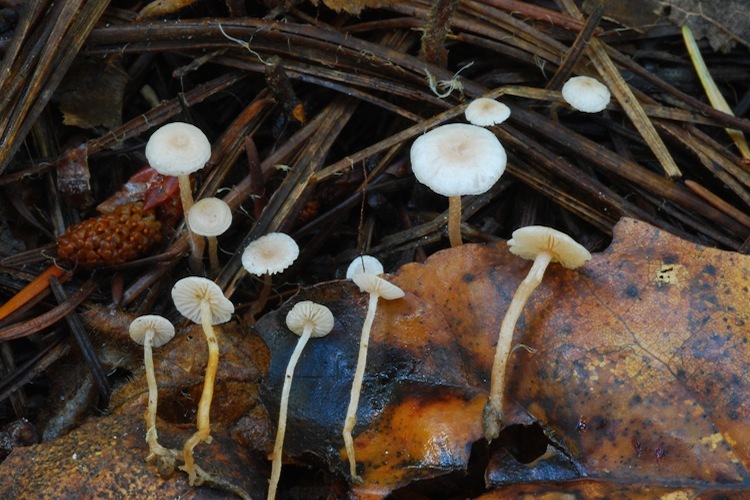 Since they are often intermingled with carpets of Mycena and other fungi that make small, pale fruitbodies, this pattern recognition is crucial. Only then can a collector pay closer attention to the size, shape, and color of the sclerotium from which the base of the stipe emerges in order to make a specific determination.